I teased you a few days ago with a little peekaboo at my friend, Nancy’s new deck. 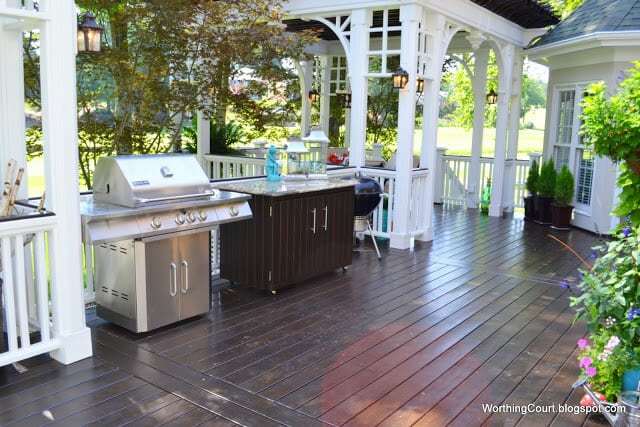 The previous deck was wonderful, but it was starting to show it’s age and there were features that Nancy and her hubby just weren’t crazy about anymore. Nancy designed the deck herself after doing lots on online research and pulling all of her favorite components together. She then put her design into the very capable hands of a local company who made her vision come to life! As you look around, pay attention to all of the architectural details. 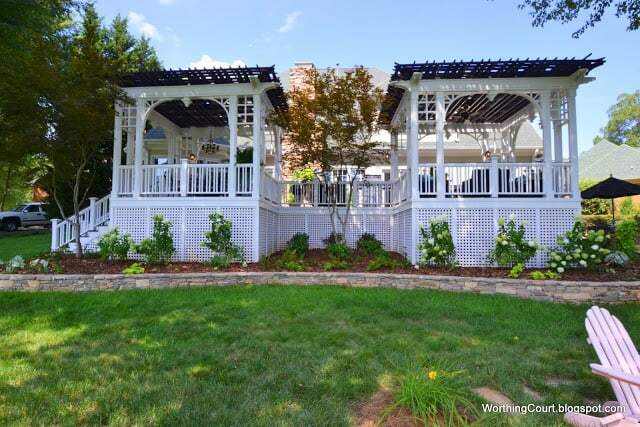 The deck contains two pergolas and looks out over a golfcourse. 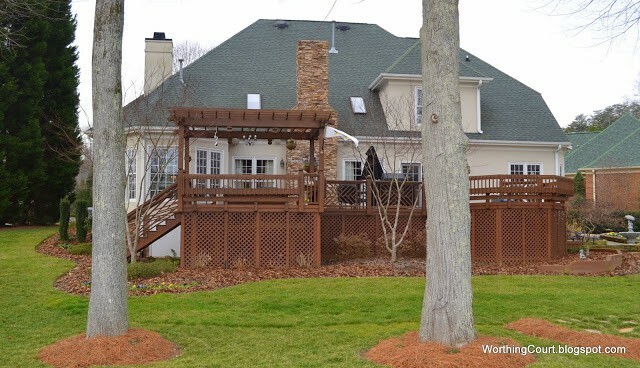 The space between the pergolas was specially designed to accommodate the existing Japanese Maple tree. Stepping out of the house through the french doors, the pergola to the right contains a lovely, shady dining area. 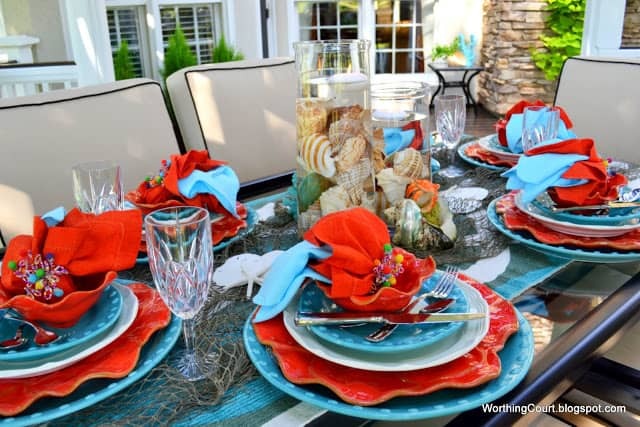 Here’s a peek of the tablescape that Nancy set up in preparation for a dinner party that she was hosting. Click HERE to see the entire table. A lounging area is located in the pergola on the left. Perfect for wiling away a quiet afternoon or evening. Nancy is the vignette queen. One of these days, I’m going to put together a post showing some of the many beautiful vignettes on the interior of her home. Take a closer look at the vignette residing on the coffee table. 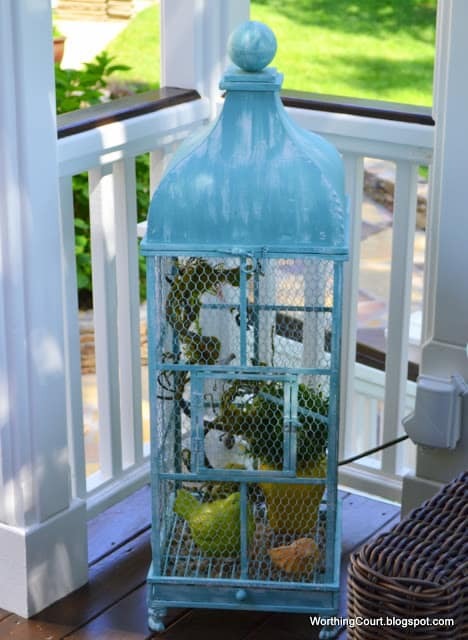 …and this to-die-for birdcage resides in another. My photo doesn’t do it justice. 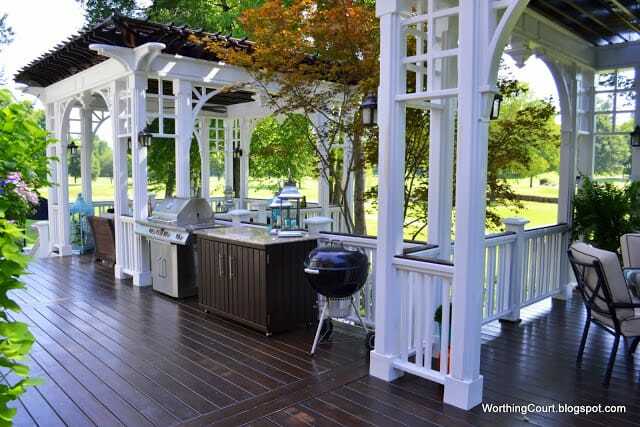 A cookout area, outfitted with a granite topped custom work station fits nicely between the two pergolas. Nancy’s special touches are everywhere! 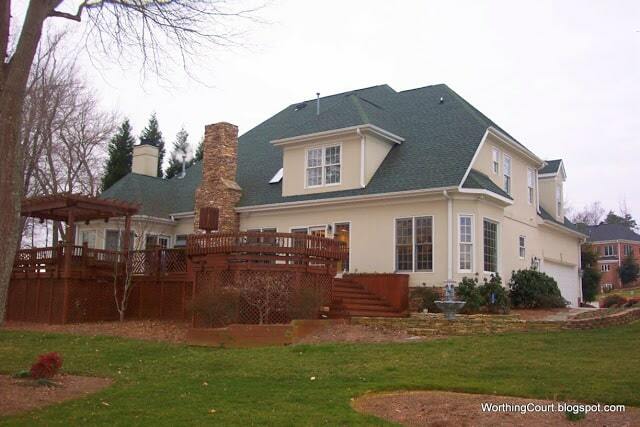 The rock chimney is dressed with a bountiful hanging basket. Steps lead down to a flagstone patio. This is where the fishy tablescape is set up. 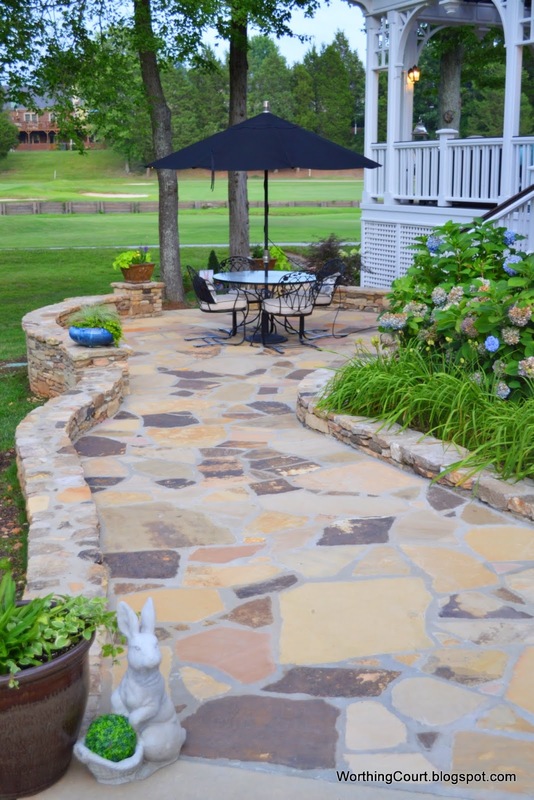 The patio area can also be accessed from the driveway. So tell me, if you were a golfer would you stop and pause in the shade of Nancy’s lovely yard? And listen to the cooling sound of sprinkling water? I bet she’d offer you a cool glass of lemonade! Here are a few before and after’s just for fun. Oh Nancy has a beautiful deck! 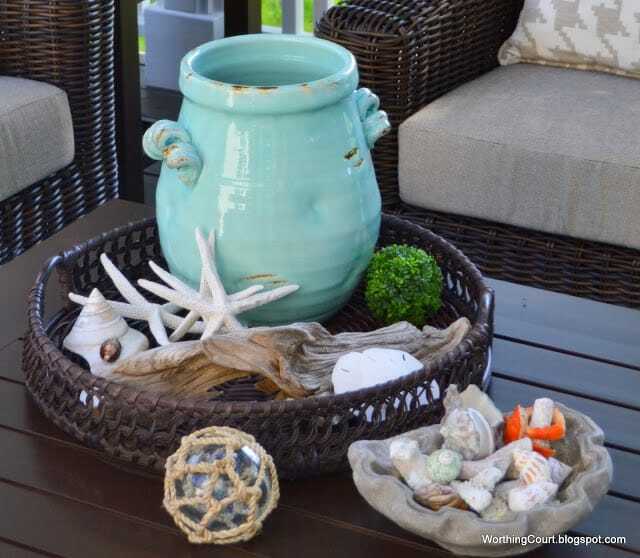 I love how she decorated with all the turquoise accents! Absolutely gorgeous! What an amazing before and after. Absolutely beautiful!!! Oh, I am so jealous of that wonderful outside area. Her before even looks better than what we have. I hope someday we can have something done to ours. Hubby just doesn’t get it because he doesn’t ever use the deck. Ours gets way too hot in mid summer. I love the dark flooring they used on this one. Absolutely stunning!!! Now, that is a deck! Love it all and the floors are just magnificent! Absolutely stunning! This is probably one of the best transformations ever! Hats off to you! Wow! What a difference! It’s like the entire back of the house was brought to life when you compare the before and after. Awesome!! 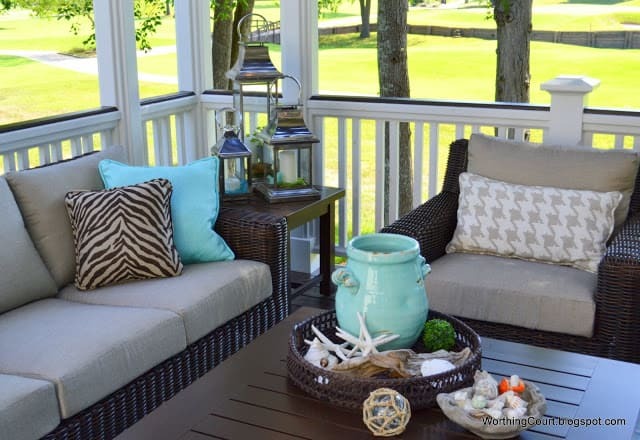 Suzy….you were right when you said we were in for a treat….That deck is magnificent…and all of the furniture and gorgeous touches are just wonderful….Thanks so much for sharing Nancy’s deck…stunning! Wow, this is beautiful! 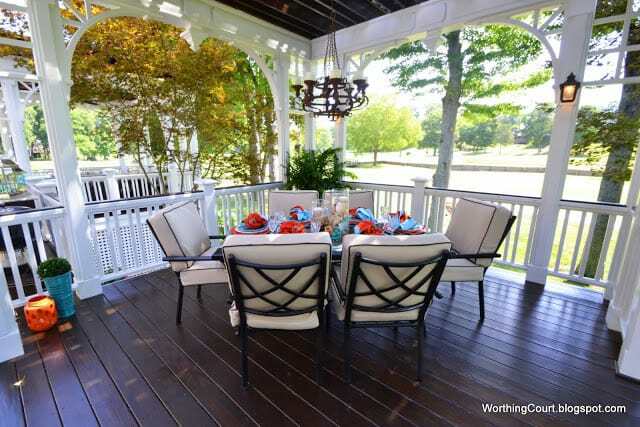 Lucky you to be able to enjoy Nancy’s deck 🙂 Feel free to introduce me to Nancy I would love to hang out in this space! lol Thanks for sharing. This is a stunning new deck. I love alw the work they did it is just beautiful. 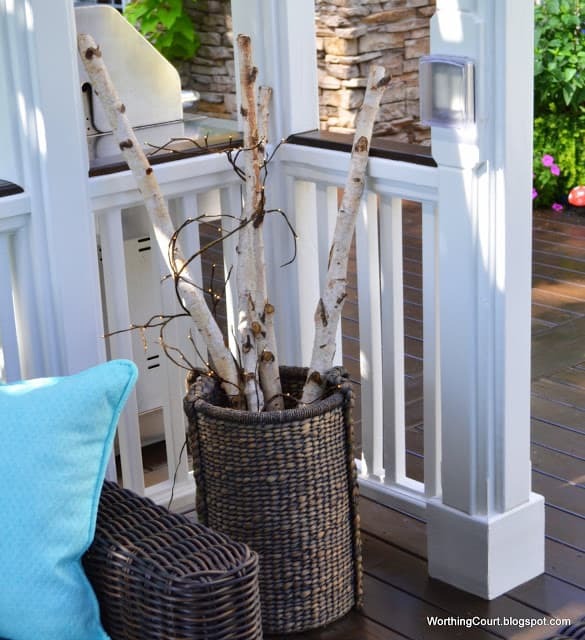 What a great use of space and I am sure they will get a lot of use out of the deck. Suzy, this is just beautiful! Nancy is one great designer! 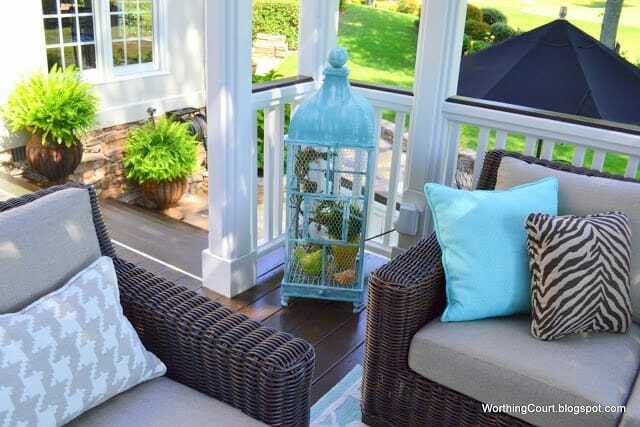 All of her outdoor spaces are so inviting and beautifully decorated. What a perfect space for entertaining and relaxation. What an absolutely gorgeous relaxing area! She did a wonderful job of planning and pulling it all together. Beautiful! I am so very impressed! They did an amazing job. And I love Nancy’s design. What an amazing place to relax or entertain! Thanks for sharing this with us! This looks beautiful! That is so awesome that she designed this masterpiece herself. When I commented above I forgot to ask, if you don’t mind sharing, where did you get that nifty drying rack in your laundry room? I ordered it from Lee Valley Tools. It’s called an accordion style drying rack. It’s really sturdy and well made! This is just stunning indeed! 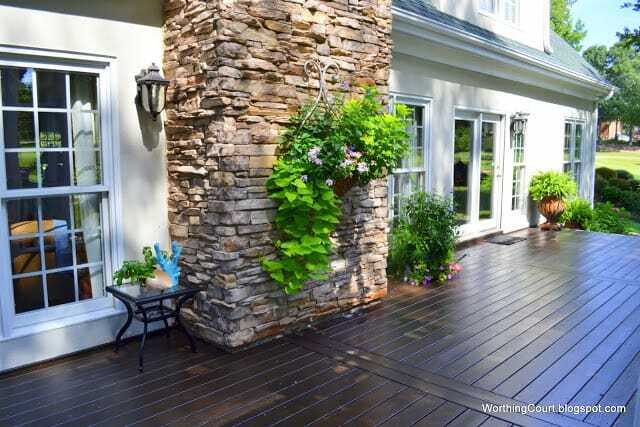 I love the decks and the beautiful stone walls with patio too! Just WOW! She has SOME style. Thanks for taking us on the tour! 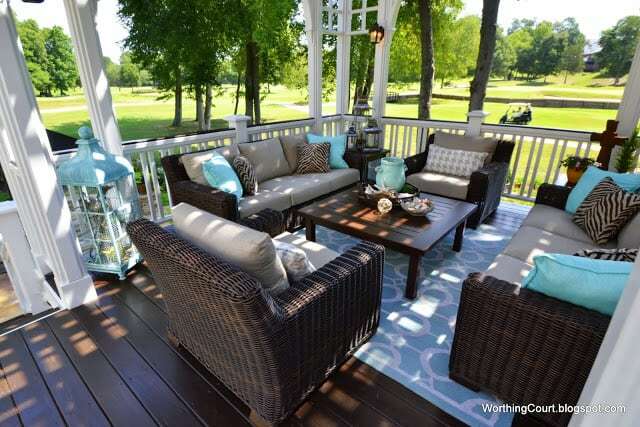 I would love to just take a nap on this deck! beautiful! Wow, just one word: GREAT!!! It is absolutely stunning! I’m a new follower! Wow, wow, wow… that is just gorgeous! Thanks for sharing! Absolutely stunning! A magazine will surely come calling! Isn’t is amazing what white paint can do! Beautiful. Pardon me while I wipe the drool from my chin! Give your friend a High-5 for me (and my name in case she ever feels like moving)! Love it! Thanks for sharing. 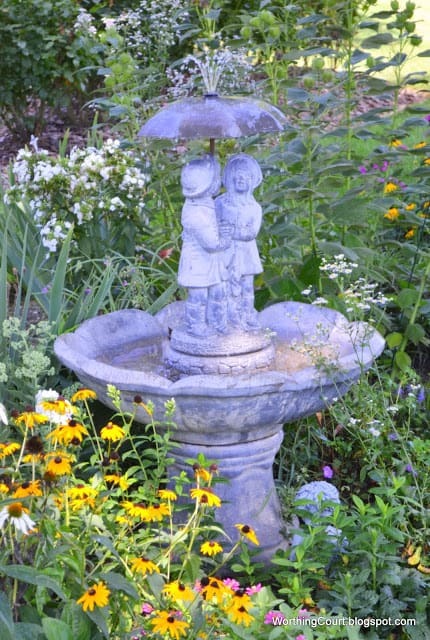 Stopping by from Kristin’s linkup. OMG! Stunning!! Amazing! Gorgeous! I need this! Nancy’s design is amazing, she’s so clever. 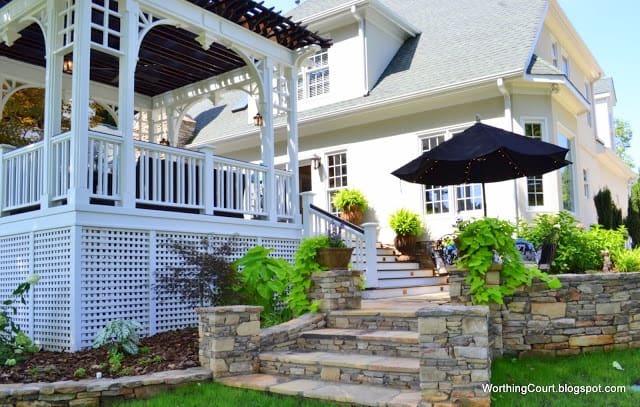 I would love to have a beautiful garden and deck like that ! 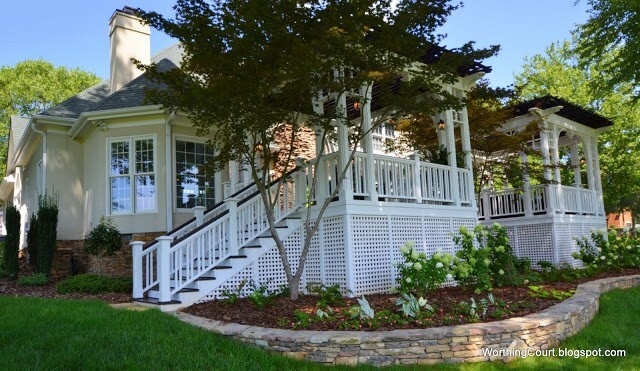 Such a beautiful deck, love the white color to match the white house. 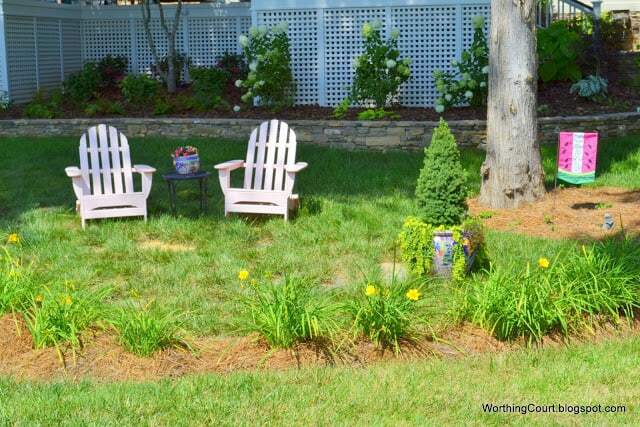 I would love to sit on the deck and enjoy the lovely yard. Wow! Amazing! I can only dream of having one like that! Great ideas! Oh it’s absolutely Grand! It really is stunning! Pinning this! Wow! 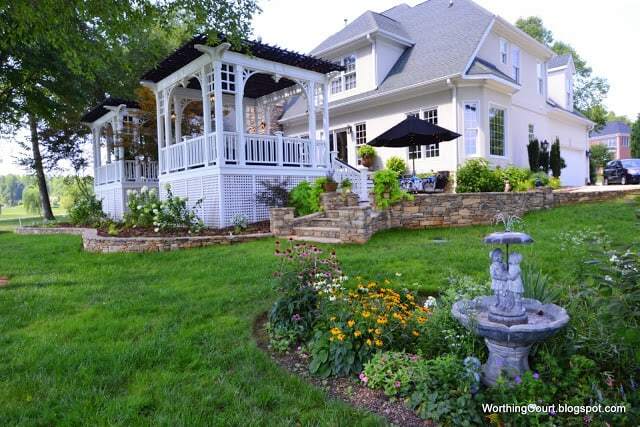 This yard is spectacular! Nancy is VERY talented! I would seriously never leave this deck!!! I’m going to show my mom this one since she’s in the house-building process. Thanks so much for sharing this. Now that is what I call a deck! I’d love to be sharing it too – not at a linky party, but with a cocktail in my hand =) I love that they made the effort to save the maple! Just too many people cut down existing natural structures to accommodate gianormous things, but with them, the new deck looks so much prettier! You’ve been featured at cowgirl up this week, go grab a featured button if you like. That is absolutely gorgeous. I will be featuring it tonight at my Fall into Fall party that opens at 8pm EST. Please stop by and pick up an I’ve Been Featured button. Thanks. Every accent is captivating!! 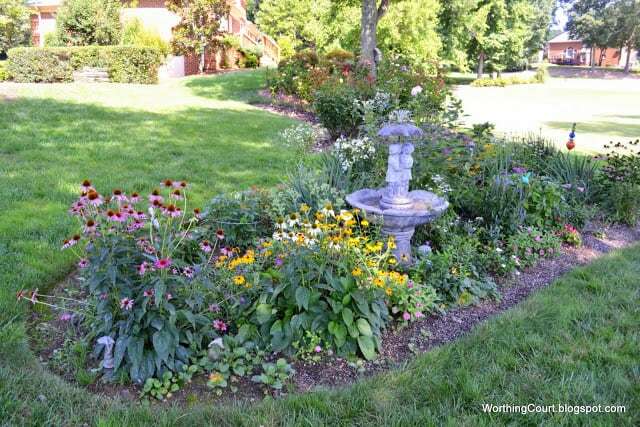 Gorgeous, just simply inviting, not outrageous, just warm & inviting! 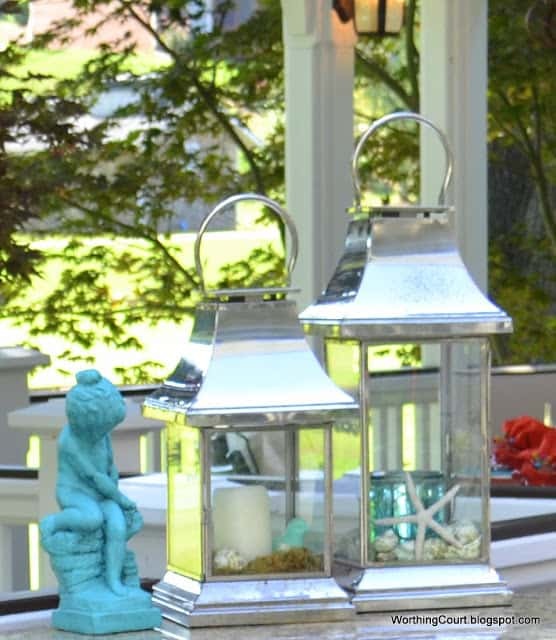 Captivating, simply inviting & tastefully done!! 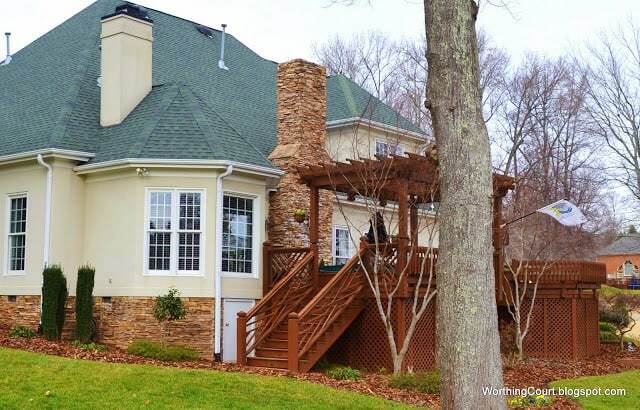 I luv how she has every little touch just finished off including the stone chimney with vines. Colour blasts everywhere!